Start off your visit on the 15th (Tue): look for gifts at Soma Chocolate Maker, take a stroll through The Distillery District, and then don't miss a visit to St. Lawrence Market. 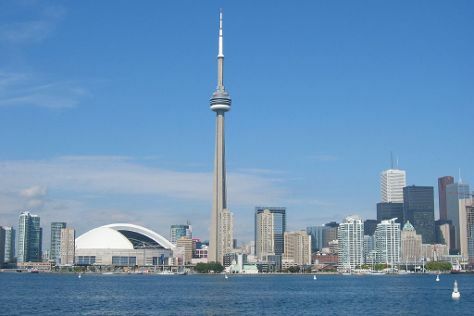 On the 16th (Wed), you'll have a packed day of sightseeing: see the interesting displays at Royal Ontario Museum, then enjoy breathtaking views from CN Tower, and then contemplate in the serene atmosphere at St Michael's Cathedral Basilica. To find reviews, where to stay, and more tourist information, refer to the Toronto vacation planner . Rio de Janeiro, Brazil to Toronto is an approximately 16.5-hour flight. You can also do a combination of flight and bus. You'll gain 2 hours traveling from Rio de Janeiro to Toronto due to the time zone difference. Expect cooler temperatures when traveling from Rio de Janeiro in January; daily highs in Toronto reach -1°C and lows reach -8°C. Wrap up your sightseeing on the 16th (Wed) to allow time to travel to Montreal. Kick off your visit on the 17th (Thu): take in the architecture and atmosphere at Notre-Dame Basilica, admire the masterpieces at The Montreal Museum of Fine Arts (Musee des Beaux-Arts), and then stop by MUA MOI Cosmetics. Inspirock's itinerary builder makes planning a Montreal trip simple and quick. Traveling by flight from Toronto to Montreal takes 3.5 hours. Alternatively, you can do a combination of bus and flight; or drive. Prepare for slightly colder weather when traveling from Toronto in January: high temperatures in Montreal hover around -5°C and lows are around -13°C. Cap off your sightseeing on the 17th (Thu) early enough to travel to Vancouver. Visiting Kitsilano Beach and Wreck Beach will get you outdoors. Your itinerary includes some good beach time at Spanish Banks and English Bay Beach. There's much more to do: explore and take pictures at Granville Island, take in the dramatic natural features at Vancouver Seawall, explore the activities along English Bay, and stop by Kaarigar Handicrafts Inc..
To see other places to visit, maps, reviews, and more tourist information, read our Vancouver trip itinerary builder app . Getting from Montreal to Vancouver by flight takes about 7 hours. Other options: drive; or do a combination of train and car. The time zone difference moving from Eastern Standard Time (EST) to Pacific Standard Time (PST) is minus 3 hours. In January, Vancouver is much hotter than Montreal - with highs of 8°C and lows of 3°C. Finish up your sightseeing early on the 20th (Sun) so you can travel back home.